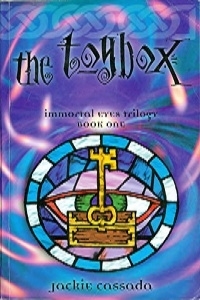 The Toybox, written by Jackie Cassada, is the first novel in the Immortal Eyes trilogy. It is a heroes' journey into the hidden world of the Dreaming, which lies just beyond the realm of our perceptions - a place where the changelings linger in perpetual wxile on the fringes of the mundane world. The scan/PDF conversion of this is different from the 2nd or 3rd volume in the series (which is probably why this file is also 5 times smaller than the other two). While the file is fine on my laptop, it's almost unreadable when transferred to my Kindle Fire whereas Shadows on the Hill and Court of all Kings are fine. I admit this is as likely to be an issue with Kindle software as with the PDF itself, but this is just an fyi for anyone who, like me, was planning on reading this on their Kindle.